When the so-called eek effect emerges while shifting a vehicle shift gearbox, car drivers perceive audible noise and vibrations of drivetrain components. Some physical approaches have been provided in order to explain the effect as well as to search for countermeasures. 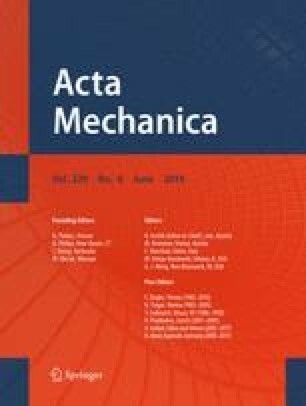 In Jehle and Fidlin (ZAMM J Appl Math Mech 94(11):911–916 (2014), the interaction of sliding clutch disk and gears is addressed in a rigid body model. The clutch disk’s non-conservative follower forces in combination with geometric coupling in gears imply the action of non-symmetric restoring- and velocity-proportional forces. The desired motion of gearbox components can therefore undergo a mode-coupling flutter instability, out of which vibrations emerge with exponentially growing amplitudes. As the contacts in clutch and gears hold non-smooth transitions such as the possibility of sticking and opening, dynamic solutions are both limited and complex. In this contribution, first of all model details concerning the gear formulation are revised: rigid and viscoelastic normal contact are compared, which imply differences in the nature of the solution and method of stability analysis. Nevertheless the two approaches are shown to converge. Finally, the dynamics behind the loss of stability of the desired motion is investigated.